Even though about two-thirds of all Hispanics nationwide are of Mexican origin, in many of the nation’s metropolitan areas Mexicans are not the largest Hispanic-origin group. For example, Puerto Ricans are the largest Hispanic-origin group in the New York area and Cubans are the largest in the Miami area. And in the Washington D.C. metropolitan area, Salvadorans are the single largest Hispanic group, comprising 33.7% of the area’s more than 700,000 Hispanics. There is no other major metropolitan area in the U.S. in which the Salvadoran population exceeds 11%. 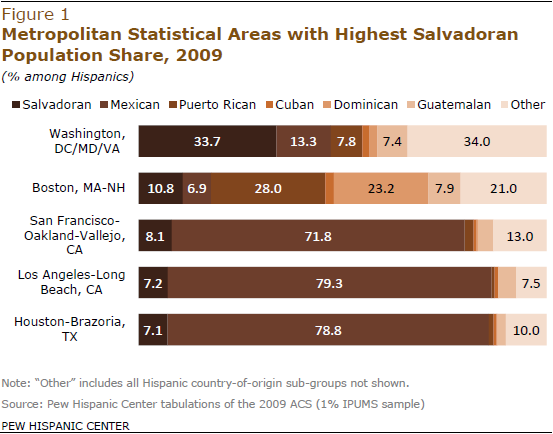 Mexicans are not the dominant Hispanic-origin group in all metropolitan areas, despite their No. 1 status in the nation. Among the Miami metropolitan area’s 1.5 million Hispanics, half (50.9%) are Cuban. In the New York-Northeastern New Jersey metropolitan area, 29.4% of Hispanics are of Puerto Rican origin and 19.7% are of Dominican origin. 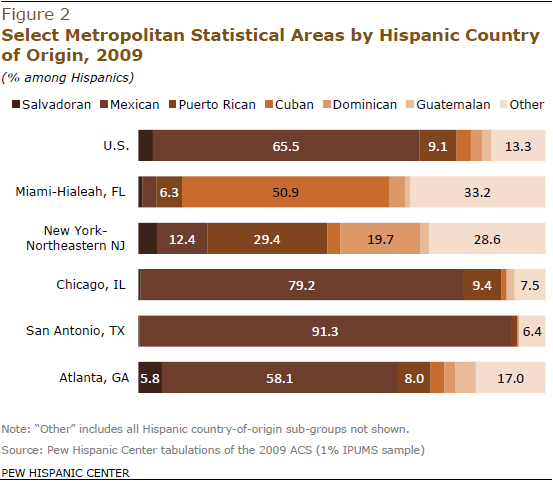 However, in many metropolitan areas, Mexican-origin Hispanics are by far the dominant group. In Chicago, nearly eight-in-ten (79.2%) of the area’s Hispanics are of Mexican origin. In the San Antonio, TX metropolitan area, Mexicans make up 91.3% of all Hispanics. And in Atlanta, GA, nearly six-in-ten (58.1%) Hispanics are of Mexican origin. The appendix to this report shows detailed country of origin information for each of the 30 metropolitan areas with the largest Hispanic populations. They range in size from 5.8 million Hispanics in the Los Angeles-Long Beach metropolitan area down to 343,000 in the Brownsville-Harlingen-San Benito metropolitan area in Texas.